For updates and further information, please check out our instagram @oneoceanconservation. 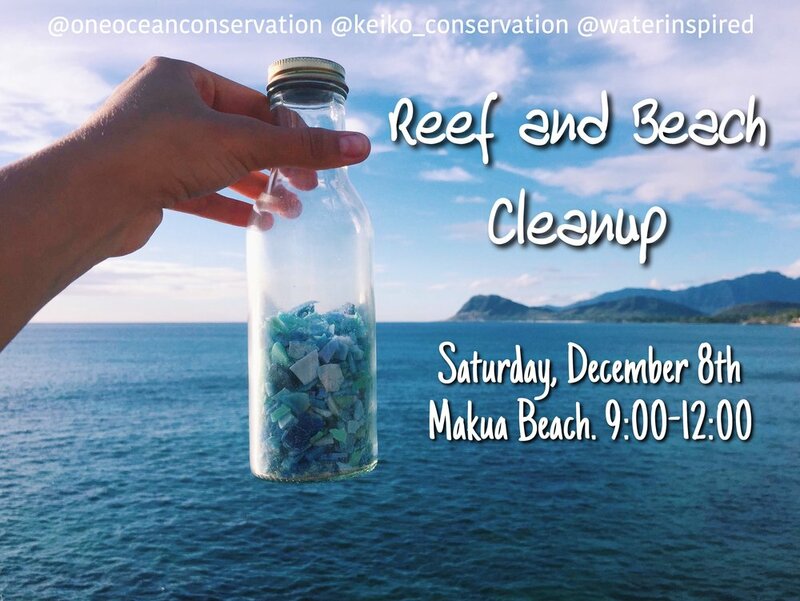 Join us Saturday, December 8th at Makua Beach for our monthly #SecondSaturday Reef and Beach Cleanup! Like usual, we’ll be at the location from 9:00am to 12:00pm, so please come by to pitch in anytime between those hours! Also as usual, we recommend bringing reef-safe sunscreen (however, we WILL have some AllGood sunscreen available for you to borrow if you like!) and a water bottle (plastic free, please! :)) plus a friend to tag along to make your volunteer time as enjoyable as possible! At Makua, there is a large stretch of sand that could be good for cleaning, but keep in mind some of the more “trashy" areas might be over near the rocky sections or trees, so consider bringing shoes that will protect your feet as you’re walking around. We will have reusable bags, sifters/colanders, scissors, and some gloves if you’d like to borrow, but as always, we welcome you to bring your own supplies, too! Thank you for continuously supporting our conservation efforts and we hope to see you on the 8th! Stay updated at @oneoceanconservation in case of any last-minute changes. JOIN US Saturday, November 10th, for our monthly beach cleanup! It’s that time again! We would love to have you join us on Saturday, November 10th at Pounder’s Beach for our monthly beach cleanup! Don’t forget to bring a filled reusable water bottle and reef-safe sun protection (like hats, sunglasses, and environmentally-friendly sunscreen such as @allgoodbrand! )…as well as friend because that always makes it even more enjoyable! :) We will have reusable cloth bags, colanders, scissors, and gloves for you to borrow if you need to, but please feel free to bring your own with you instead! Hope to see you there!! Join us Saturday July 21st for a reef and beach cleanup and to Celebrate PADI Women's Dive Day! Join us June 9th for our reef and beach clean up! Help us #SaveTheOcean by cleaning up marine debris and trash as well as (conditions permitting) removing fishing line from the reef! Win prizes, enjoy some time at the beach, & help save sea turtles, dolphins, sharks, whales, reefs and more. Join us at Eletric Beach. Amazing prizes from #Oneoceandesigns @clarklittle @oneoceandiving@thessalonikecollection @albabotanica@oakley @ecoceanic @keiko_conservation@reallifemermaidshop @guayaki @stillsane@yogakaihawaii @naturezwayofficial@4ocean @knektusa @corepoweryoga@breathless_collective and more Hope to see you there. Win prizes, enjoy some time at the beach, & help save sea turtles, dolphins, sharks, whales, reefs and more. Join us at Makai research peir. Amazing prizes from #Oneoceandesigns @clarklittle @oneoceandiving@thessalonikecollection @albabotanica@oakley @ecoceanic @keiko_conservation@reallifemermaidshop @guayaki @stillsane@yogakaihawaii @naturezwayofficial@4ocean @knektusa @corepoweryoga@breathless_collective and more Hope to see you there. We have lots of bags but always recommend a mesh bag & gardening gloves for the beach clean up :-) We are having a challenge with a free spot out with @oneoceandiving to the two people who collect the most straws. And remember to #stopsucking because every day 500,000,000 straws are used in the USA alone. LOCATION: Meet at Waimanalo Beach Park. Park in the large parking lots across from the baseball field and walk down the path to the beach! Be on the lookout for tables and banners with ONE OCEAN DIVING and KEIKO CONSERVATION and WATER INSPIRED! 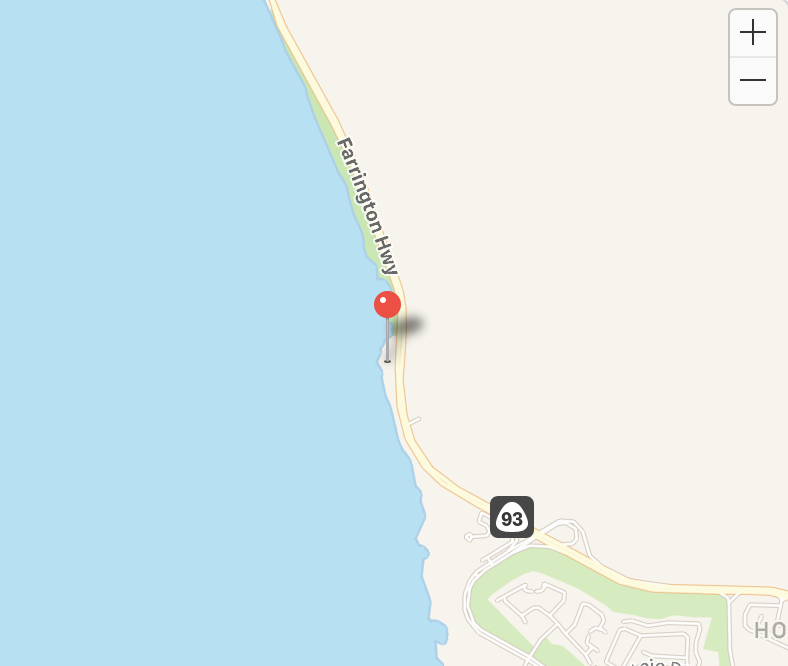 Directions from Town: Take H1 East, continue onto Kalanianaole Highway/HI-72, take this road for about 13 miles and Waimanalo Beach Park will be on your right hand side. Directions from Kailua: Head southwest on Kailua Road, turn left onto Kalanianaole Highway/HI-72. Take this road for about 4 miles and Waimanalo Beach Park will be on your left hand side. We've got another reef and beach cleanup coming in just a few short weeks! It will be at Pua'ena point on north shore of Oahu and just in time before the winter surf comes in! So come join us Sunday September 17th from 12-4pm for a day in the sun giving back to our oceans on the beautiful north shore. #SaveTheOcean by picking up rubbish from our beaches and off our reef! Amazing giveaway prizes from our wonderful sponsors! Click the image to RSVP to our Facebook page and learn more! What better way to celebrate our nation than taking care of the land and seas we call home? Our beloved beaches take a hard hit on the 4th of July with lots of trash left behind after the Indepence Day celebrations and we're here to give back to the land of the free by helping it be free from debris! We'll set up at the Magic Island side of the Ala Moana Beach Park near the big parking lot (free and ample parking space!) around lifeguard station 1E. Please bring reusable water bottle, reusable bags and sunscreen for yourself. Come join us for a beach and reef cleanup Saturday June 24th from 11am-2pm at Wai'alae Beach Park. We will have tons of prizes from all of our sponsors and more! No better way to spend a Saturday then giving back and cleaning up our coastline! Hope to see you there! Click image for Google Maps location! Please park in this parking lot! at Laie Beach Park "Pounders Beach"
Please join us THIS Thursday for a beach cleanup in Laie for World Oceans Day. What a great way to give back and celebrate everything wonderful about the water! This will be another collborative event between One Ocean Diving, One Ocean Conservation, and Keiko Conservation! Being an eastern facing beach, Laie Beach Park gets inundated from trash from all over the world! So come out and show some love to the 'aina, and get inspired to reduce your use of single use plastics! Mahalo to all of our sponsors for supporting our efforts and donating prizes! 4Ocean, Devocean, Happy Earth Apparel, Clark Little, Guayaki, Core Power Yoga, Xcel, Real Life Mermaid Shop, Yoga Kai! Want to help #SaveTheOcean on #Oahu next weekend? We are thrilled to announce this awesome #Sweat to Save #SeaLife#CharityEvent at #AlaMoanaBeachPark TODAY! Starts at 11:30 AM! We are so excited to be able to be apart of Kaiser High School's Earth Fest this Friday from 1:30-8:00pm. It is a community event great for the whole family! And with earth day right around the corner this is a great way to celebrate how wonderful our planet is! 🌏 Come stop by at the @oneoceandiving @keiko_conservation booth and learn from other companies, organizations and individuals how you can make a difference and get involved in your community! Click the photo to RSVP on Facebook! We are partnering with SUSTAINABLE COASTLINES HAWAII to host a reef and beach cleanup! Join us for an Earth Day Celebration focused on giving back and keeping our reef clean. SCH is teaming up with Hawaii Eco Divers, Island Divers, One Ocean Diving and Keiko Conservation to add an underwater element that will incorporate a SCUBA, SNORKEL, and FREEDIVE cleanup! Check in and cleanup starts at 9AM and lasts until 11:30 AM. 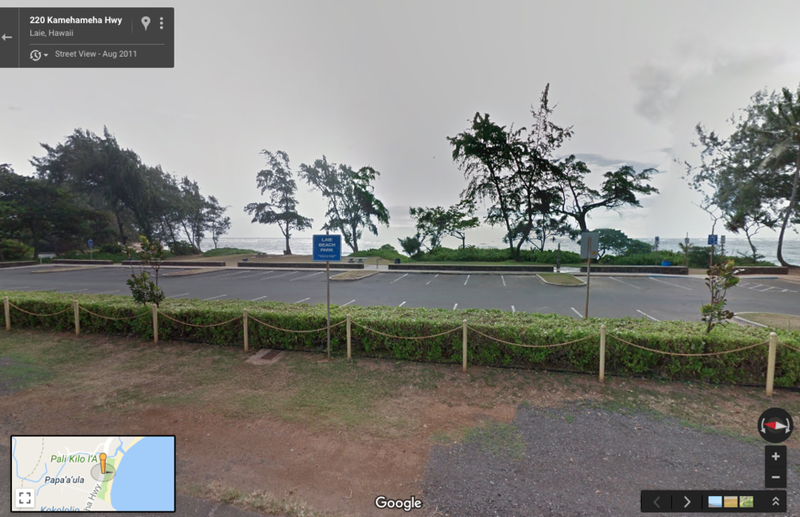 Park at Makai Research Pier or take one of our buses to the site from Waimanalo Beach Park. Buses will begin departing at 9:30AM. If you are SCUBA certified and want to dive, bring your certification card and your own equipment. Gear and tanks are available, but first come first serve! For SNORKELERS and FREEDIVERS you must bring your own gear. We have limited supply of mesh bags so if you have one please bring it! Please be gentle when removing nets and plastics from our fragile coral reefs. Dive knives and scissors strongly recommended for removing fishing lines and nets from the reef. Our goal is to remove the underwater debris that is destroying the reef and endangering sea life. Last year we had over 600 people help cleanup up 10,000 lbs of trash off the beach. Help us clean up even more this year with our first underwater cleanup to keep our coastlines clean and inspire year-round coastal stewardship not only through beach cleaning, but through simply using less plastic every day. Click the photo to buy your ticket! Wednesday April 26th "A PLASTIC OCEAN"
April 26th we're hosting a screening of #APlasticOcean with our affiliates at @emptythetankshawaii and @keiko_conservation Click the link in @keiko_conservation bio or on the image above to get tickets and check out the FB event page :)!!! *The % of ticket sales will all be going directly to @keiko_conservation_ecuador and their partner's efforts to rescue, rehab, and release local injured marine wildlife. * Can't wait to see you all there! RSVP on Facebook (click on any photos) and spread the word by sharing our fliers! 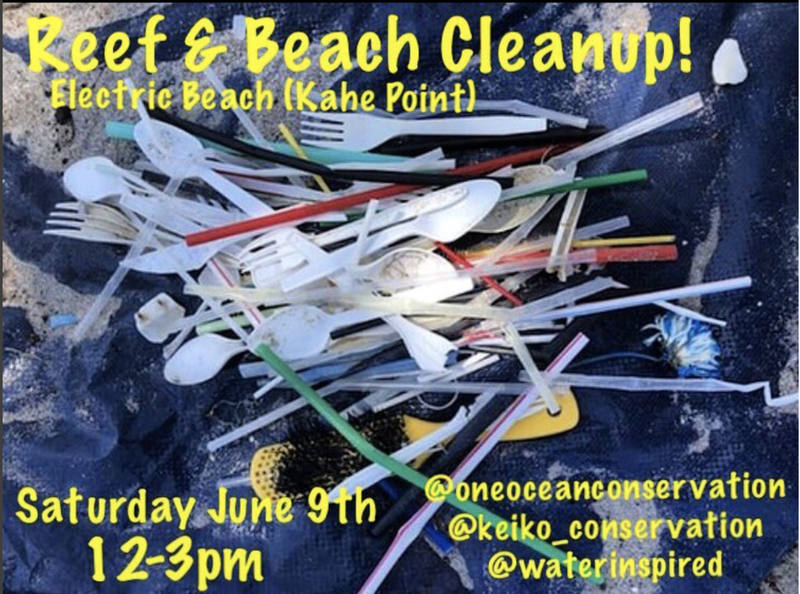 Please join us Sunday March 5th at Waimanolo Beach Park from 12-4pm for our latest beach cleanup event in partnership with Keiko Conservation and Water Inspired Conservation Group. In addition to diving along to reef to collect fishing line and lead weights, the focus of this cleanup will be on picking up land based marine debris making its way into the ocean as well as sifting the sand for micro plastics or “nurdles". We will also have a Keiki education hour and yoga session at 11:00am before the cleanup brought to you by Core Power Yoga. The event will be great for all ages and is a fun way to get the whole family involved. We will have prizes for people who collect the most trash from One Ocean Diving, Guayaki, Core Power Yoga, Xcel, Keiko Conservation, Shells4Sharks, Clark Little and more! 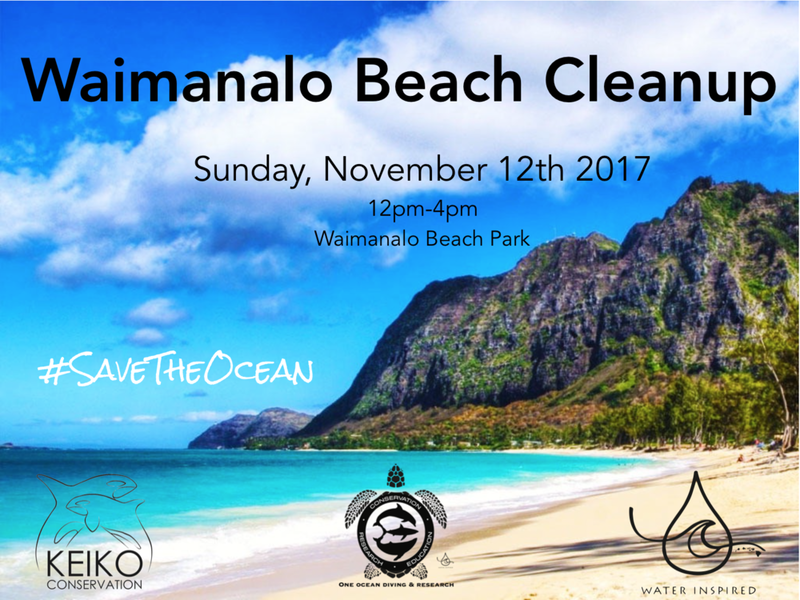 The cleanup will take place at Waimanolo Beach Park. We will start there and make our way down the coast toward Makai Pier collecting as much plastic and marine debris as possible. Check out the map and photos above for the specific location and directions. Be sure to bring a reusable bag to collect debris, a pair of gloves, sunscreen, snacks and water. We will have a limited supply of mesh bags, scissors and sifters available for use but feel free to bring your own if you have extras! This cleanup will also feature our partner Keiko Conservation’s latest campaign the #NerdsAgainstNurdles challenge for a chance to win a free sunrise shell necklace from our non-profit benefit line Shells4Sharks. Collect as many pieces of plastic or garbage as you can, make an image of your favorite sea creature or spell out a conservation message, post it on Instagram with the hashtag “#Shells4SharksGiveaway”. Multiple entires are also welcome if you want to get a head start and practice your #NerdsAgainstNurdles designs at a beach near you before the cleanup. You don’t have to be present at the cleanup to participate, so be sure to tell your friends to maximize our collective impact! The winner of the contest will be announced at the end of the cleanup. We can’t wait to see your submissions!